Etihad Guest surprised me yesterday by announcing a devaluation, due to kick in from July 8th. Given their aggressive behaviour in recent months in offering transfer bonuses, route bonuses and credit card sign-up bonuses, you might be forgiven for thinking that you had been sold a pup. At least British Airways didn’t have a single Tesco or American Express transfer bonus in the 18 months before the Avios devaluation. No-one could argue that they had been persuaded to convert under false pretences. Number of reward seats in business class increasing by 20%. I don’t understand this – Etihad traditionally releases two seats per flight in business. Will there now be 2.4 seats?! If the airline had any commercial nous, they would start releasing four seats per flight. At the moment, Etihad Guest miles are very unattractive to high-end travellers with family as it is impossible to redeem in business class unless the family is split up. Economy redemptions do not change in price and will fall for flights over 6,000 miles. A minimum of five economy seats will be released on every flight. Business Class redemptions will increase in price except for flights over 6,000 miles where they will remain the same. The scale of these increases is SUBSTANTIAL – London to Abu Dhabi increases by 50%. First Class redemptions will increase to all destinations. It is difficult to argue about the logic here. The difference between Business Class (44,000 miles) and First Class (55,000 miles) one-way to Abu Dhabi was too small. However, a 59% INCREASE between London and Abu Dhabi is huge. I have summarised the new rates between London and Abu Dhabi below. Existing redemptions can be changed at will without triggering any price increase. Upgrades will become more expensive and the cheapest tickets (T, E, Z) will not be upgradeable. At present, only ‘T’ fares cannot be upgraded. It will cost $50 PER FLIGHT on economy redemptions, $100 PER FLIGHT on business class redemptions and $150 PER FLIGHT on First Class redemptions. This is on top of the additional miles that will be required. Note that these are ‘per flight’ – a business class redemption to Bangkok from London via Abu Dhabi is four flights so the surcharge will be $400. What is impact of this on a typical redemption? If you want to check the pricing on other routes, the online Mileage Calculator is here. These are big increases. There is no disguising it. An increase of 50% in the miles required for a business class redemption – plus introducing a surcharge – is having a laugh. The Avios devaluation only resulted in a 25% increase in Club World pricing if you flew off-peak. Of course, you should look at these numbers in the context of Avios. Given a choice between using 120,000 Avios + £550 of charges to fly Club World to Abu Dhabi or Dubai, versus 132,000 Etihad Guest miles + around £350 of charges to fly the A380 Business Class Studio it is still no contest. Etihad Guest also gives you free chauffeur transfers at both ends as well. Emirates Skywards now tops both of these schemes. You will only need 90,000 miles plus around £600 of charges for a ‘Saver’ level business class return to Dubai. If you pay the higher level of 125,000 miles you can effectively have any seat on any plane. That said, if it turns out that I will be able to book four Etihad Guest seats in Business Class to get my family on holiday, I may even begrudgingly accept the changes. At present, Etihad Guest is a fantastic scheme but not one I can use except for occasional solo trips. If you don’t like the sound of these changes, I recommend that you book before July 8th if you are looking for a Business or First Class seat. Further details can be found on the Etihad website here. Remember that you can also redeem American Airlines miles for travel on Etihad – at least for now. I would not put money on that deal still being in place in 12 months. Redemptions via AA will cost substantially fewer miles (London to Abu Dhabi will be 60,000 AA miles in Business Class vs 132,000 Etihad Guest miles) and should not incur any carrier surcharges. Would I be able to change my December business redemption AUH to MAN to first class at old rates AUH to LHR? Apologies for the OT post (although it’s about another ME airline to not totally off topic!) but anyone know of an easy/cheap way to get 250 Emirate miles? Both my parents are just 250 miles short of having 30,000 miles, which would transfer nicely across to Heathrow shopping vouchers as it needs to be in 2k increments (they were initially looking at using them with Easyjet but can’t quite decide where they’re going to go to!). You can transfer FROM Heathrow Rewards 1:1 with minimum 250, but they don’t have any points in their HR accounts. I’ve got plenty but looks like it does a name check on them. Similarly all their MR points are over with BAEC now, I could help out but it seems to do a name check too. Best I could see was 500 pts for an IHG hotel stay but they’ve only got a month left before they expire so it’s getting tight for things to post correctly. It would be easy to set up a couple of e-rewards a/cs and answer a few surveys. Looks like they need 2000 x 2 e-rewards points which is easy enough if they’re prepared to put the time in. They would even get 200 Skywards miles just for joining up & completing 2 surveys which I think x2 gets your parents over the finishing line in itself. The option points from e-rewards normally transfer over in a few days – your problem would be could they get enough surveys done to reach the target needed in time – I can go a week or so without a survey offer then I get a load at the same time – a bit hit or miss – but if you get the number of surveys they transfer quickly even though it says 4-6 weeks. Thanks, Liz – sounds promising, might be worth a shot! Thanks to Greg (one of the other posters on here), who emailed me to remind me that Heathrow Rewards allows free transfers between members and that they’re instant! I’d actually done this before, but totally forgot about the option. I emailed them and within a few hours the points were in my folk’s accounts. I then transferred them to Emirates and those transfers went through instantly too! Very impressed again with Heathrow Rewards CS (so nice to get a personal reply, very promptly too) and also shows that Amex MR should be able to do these sort of instant transfers too! Anyway, just wanted to post an update in case it’s of use to anyone else. As a family of 5, we have to travel like the royals -ie, travel separately on different days. So not increasing seats is a missed opportunity. More negative is the huge increase in miles + the surcharges. Have way too many Etihad miles that we will force to use because seems it is nigh on impossible to use Etihad miles on their “partners”. Way too complicated and even 10 months out, there is a I availability supposedly. Checked for First class redemption out of JFK and for the months of Feb and March there is none on the A380. Only on the crappy Jet Airways disaster (hard product, food and service). The surcharges are a killer from the current ones. Guess Etihad has to make money to stave off the comments that it is getting subsidies! Final comment – the Etihad premium Twitter account is rubbish. All it is are people complaining about service or miles not credited and similar things. And all The Twitter people do is forward to Guest relations. Another marketing stunt which I’m sure they are regretting. If you have to use the miles anyway your best bet might be9 to book on spec. Worked for me way back when SQ introduced a380. There is a good chance one of two things will happen by next March. Either the 777 will be replaced by another a380 or J will be upgraded to the business suite. The latter program has already been announced and my guess is they would try to put comparable products on JFK route quickly. How do you use Etihad miles for AA redemptions? And, have these also been affected by the changes announced? Or will they only be affected when AA announce their changes? I’d be interested in knowing that as well. You obviously can’t online but not sure how easy it is by phone. In the example you give, I personally think the previous rates are the ones that can be described as “having a laugh”… Business class being less than 50% more than economy is ridiculous! Though of course it would be better for that to be addressed by economy decreasing in price. However, even if you were previously ‘off market’, you need to be careful about how you adjust your pricing as your customers get very annoyed. It is a problem I have myself – there are HFP advertisers who I should have charged more as readership increased but I didn’t. It is now difficult for me to push through a huge price increase for these people because I will get push-back, whilst if I had done incremental increases along the way it would not have been an issue. Hmm, well I guess it was just a bit too good to be true. We’re unlikely to be in a position to redeem before the 8th July as we already have a number of trips lined up over the next year, including a BA redemption I booked before the Avios devaluation. So consequently what we were building up for a return trip to the Middle East or one-way further afield is likely to get us 2 x one way to the Middle East only now. Good thing I’m working towards an Avios rewards upgrade voucher that we can use in the other direction…. Still, with 2 x 25K MBNA signup bonuses between us and ~40K of MR points converted with a 25% bonus it is still not bad value (and better than cashing out to pointspay), just nowhere near as good as we thought we were getting. do we think the etihad shop will change the cost of vouchers like amazon in miles then too? A concern for me too as I was planning on vouchers in the even all my points don’t fall into place before 8/7. After getting in touch with the CEO I finally got a sensible response from Etihad. If you want to book with the majority of partner airlines a manual request has to be made to book this. However, no call centre staff seem to know this and just claim there is no availability. Thanks for all the advice. Wife and I had the 35,000 points card sign up each so we each have 40,000 + AA points. 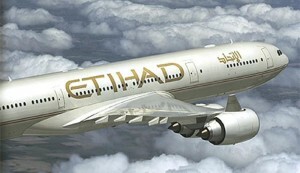 I just booked 2 AUH to LHR in Etihad 380 First for next March. I have Etihad Gold from status match from CX Gold. I should add that the cost was £14.20 each!! I moved my long-haul needs to EY and reached platinum in 7 months. Yes, I feel I was sold a pup, and on top of this I had another ordinary experience recently. I got stung with every possible charge when I brought forward a flight from LHR to SYD by 12 days when my mother in SYD died in April. I wrote to Guest Relations asking if the charges were reasonable. and they told me that I while would have to pay the fare difference, they would have not charged me the £275 change fee ” if I had been able to provide a death certificate at the time of rebooking”. Not exactly a sensitive response…..when best practice appears to be waiving the charge in the first place (and sometimes the fare difference as well). EY are pretty good in the air, the prices are good, but it seems on the ground they are immature and lack polish – whether it be their website (you cant see your bookings when you log in), the transfer experience in their hub (premium lounge closed for nearly a year, shambolic security re-screening), or taking a month to answer my question on the above bereavement. I certainly dont feel the benefit of being a top tier member. I had a (very helpful) experience with Emirates at Easter but which was also odd. I rang them to change a redemption ticket by a day. The passengers were my wife and my daughter. The ticket had been booked from the account of a female friend with whom I had swapped some hotel nights for some miles she didn’t need. Despite that, Emirates was happy for me to change the ticket around! BA would never let you do that unless you were an authorised user. I think in the Middle East they are more used to men not allowing their wives to call and doing it for them! That’s lucky but then again you may be right ! Changing a redemption with EY is the very issue that now vexes me. I have to book by July 8 to avoid the points changes, but I cannot be so certain about my travel dates. I was aiming for a LHR-SYD-LHR in J or F. What worries me is that if I book now, and try to change the dates later, they wont accommodate it or come up with a bunch of charges, even if seats are available, for whatever reason they want to. Looks like Etihad is further devaluing it’s program by blocking the award space. Impossible to book anything in Guest 1st. Yes, they stated disappearing yesterday morning first the LHR route then JFK followed by SYD . Thankfully I booked 2 guest first apartments on Tuesday morning which ticketed last night. Roll on next April AUH-SYD 3A & 4A here we come.